i wish i could wink: OOTD: New Shoes! This is what I wore to work today- summery! I love this outfit because it's so so comfortable (basically like wearing pyjamas) but is so easily dressed up with the accessories. Can we just talk about the shoes- how amazing are they? I bought them yesterday from Bershka, which is a shop I hardly ever go in, but I happened to by with a friend who wanted to pop in, and I'm so glad I did. Not only are they tremendous, but they were reduced from £69.99 to just £25.99!!! And they were the only pair left, and in my size. Fate I tell you. They remind me of the Maison Martin Margiela for H&M collection. I will definitely be going in Bershka more often from now on! This outfit looks designer, you've put it together so well! 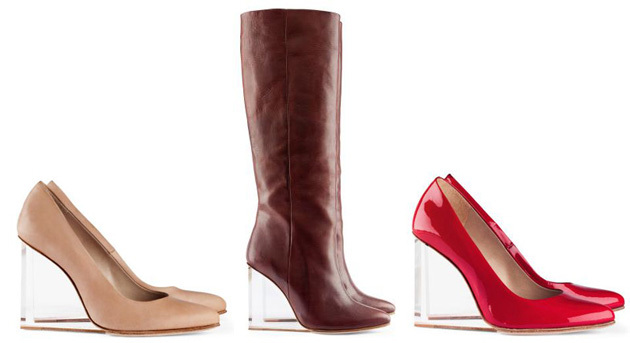 The perspex heel is bang on trend too. I don't go into Bershka that much, but I will definitely have a rummage in there next time! Had to pop over to your blog as it's been a while. I saw your shoes on Twitter/Instagram and immediately was a fan of the perspex heel they just give the look an overall higher quality feel. But agree with the comment above you're really well put together in this outfit! Thank you very much :) I'm glad it looks high end cos it's just so comfy!! !